We all have special circumstances. No one makes it to adulthood without scrapes, bumps and bruises. Some break a bone or two and if you’re lucky you heal. Some have aches in those bones for the remainder of their lives. Some never fully heal. When those bumps and bruises come so rapidly and so frequently, we don’t have time to heal. In this turmoil we are forced to find ways, tools and techniques to survive those experiences. How we learn to survive happens so quickly, so thoughtlessly, that only upon reflection can we realize the process, the steps. How did we make it through those difficult times? When all things looked murky and I could not see the bottom of the creek past the jetsam and flotsam of other people’s hurt and anger, I made up a game. This game was to take the small beauty, the simple graces, a kind word that came my way and hold them close. 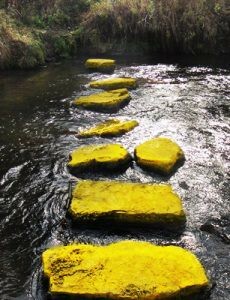 I imagined them as golden stepping stones in that fast moving dire creek. I would imagine lifting myself out of the sewage of pain up onto that golden stone. I would stand there, remember that moment until I could see another golden stone to move toward. Those stones represented simple things, like a genuine hug from someone who did not want anything from me, sincere words of praise, a gift of teaching. An aunt would take the time to show me, in great detail, exactly how to do a task; a task of which, it would seem I should have been taught already. It was not pointed out how those tasks of threading a needle or washing my clothes was over looked in my development, but with kind words and a gentle approach I was taught in that moment. Those were stepping stones that I didn’t understand at the time, but it remained in my mind as a golden stone that got me through. I remember holding on to that feeling, that moment of kindness until the next one appeared. It is no small task to take that step either. To lift your foot up and move it across the unclear water, where there is no sign of the bottom, trusting your foot will land on the next stone is an act of faith. Those golden stones are gifts if we can see them. They might not come in the grande, extravagant moment — you won’t see balloons, no parties will be thrown, and today you won’t receive a cell phone notification with ding — but they are there. Those small moments are what will keep you afloat. They seem like small things, but once you take that step you’ll realize it is a stone, solid and true. You never know when your kind words are someone else’s golden stone.